The photo at issue depicts a dockless bike on a sidewalk. The New York Post published an article on dockless bikes and included the photo. You can get a sense of that story from my screenshot of the NY Post article at the right. However, I deliberately did not include the whole photo for risk management reasons, even though seeing the whole photo and newspaper page would be more helpful to you. The court never says that the NY Post had proper licenses to the photo, but it’s implied that it did, and it wouldn’t matter to the results either way. 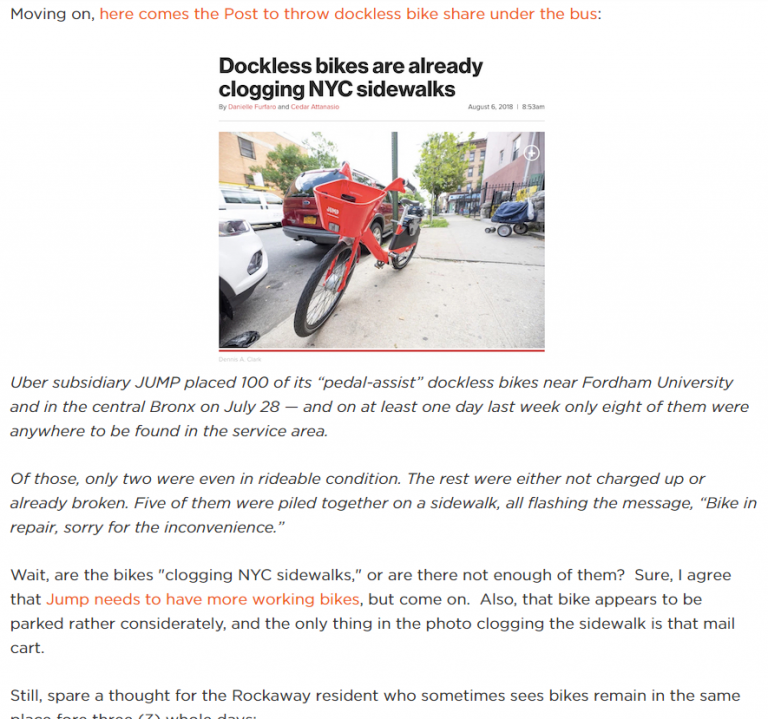 Shortly thereafter, the Daily Bike Forecast blog wrote a blog post criticizing the NY Post article. It appears the blog drops posts after a few months, so I couldn’t find the blog post online (otherwise, I would have included a screenshot of it!). The blog post included a screenshot of the NY Post’s article, but only the headline, byline and photo (similar to my screenshot at the right, though I presume it included the entire photo instead of my cropped depiction). 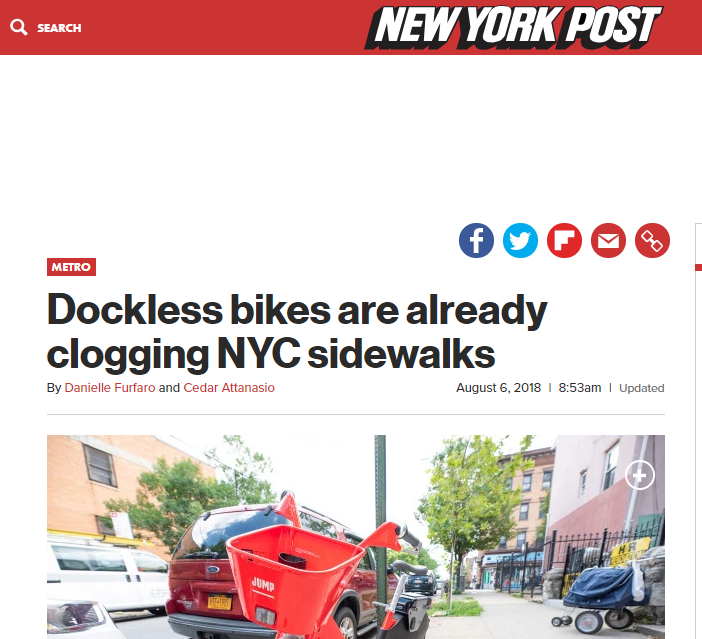 The blog post then fisks the NY Post article, pointing out that the photo provides evidence contradicting the article text (as you might infer from my screenshot, the bike in the photo didn’t actually block the sidewalk despite the headline’s “clogging” claim). use of the Photograph constitutes an expression of the author’s perception of basic flaws in the Post’s coverage of the topic. The Photograph as a standalone image, or a different photograph of a dockless bicycle, would not have sufficed. The court says it’s still transformative that the blog post critiqued the NY Post article, not the photo directly. It also helped that the blog post was an opinion piece on a non-profit organization’s blog. Nature of Work. The photo has “a modicum of artfulness,” but this factor isn’t that important. Post Article to highlight the Post’s decision to place this particular photograph directly alongside the Post Article’s headline.” As you can see from my cropping to include less than 100% of the photo, it doesn’t confirm that the sidewalk is clear, though the entire photo does make that clear. So I think it’s impossible to crop this photo and still support the blogger’s claim. The court concludes by implying that maybe this lawsuit is part of a litigation factory: “Clark’s arguments so fail to track the facts of this case that they read as if taken from briefing in litigation over an entirely different fact pattern.” This probably plays a non-trivial role in the court’s willingness to find fair use on a motion to dismiss. Given the tenor of this ruling, I expect that the court will award a 505 attorneys’ fee shift if the defendant asks for it, in which case this lawsuit will be an expensive mistake by the plaintiff. This ruling reaches the sensible inclusion that screenshotting a newspaper headline and photo, in order to critique the article’s inclusion of the photo, constitutes fair use. Yet, this result superficially conflicts with an uncited ruling we blogged in December, Hirsch v. Complex Media–also from SDNY. That case also involved a vlogger’s republication of a screenshot of a NY Post headline and photo, in a video story where the screenshot appeared for no more than 4 seconds. Yet, unlike the Clark ruling, the Hirsch court denied the defendant’s motion to dismiss. commentary on the photo. The blogger obviously commented on the photo, while arguably the vlogger focused more on the newspaper headline and didn’t necessarily comment on the photo as such. I still think that the vlogger should qualify for fair use, but maybe the court will be more amenable on summary judgment. (I checked the Hirsch case and it’s been dormant since the December ruling). blog post vs. video. Maybe the expectations differ for video, where the vlogger can control the duration of the depiction? The vlogger displayed the photo for a very short time (only 2 seconds were unblurred), so this hypothesis doesn’t seem likely. advocacy. The plaintiff lawyer clearly didn’t impress the judge, and perhaps that meant the case wasn’t as well-argued as it could have been. this opinion suggests that any collateral copyrighted material in the screenshot–such as a photo the newspaper licensed from a third party–is liability bait, no matter how briefly it’s shown. Fortunately, there is an obvious but suboptimal solution. Video producers taking screenshots of third party newspapers need to blur EVERYTHING–ESPECIALLY PHOTOS–other than the minimum they need to establish their point. All of this is silly. Screenshots are a helpful and integral part of the information ecosystem. I hope we get more screenshotting rulings on a motion to dismiss (+ fee shifts) so we can redirect our energies to more meritorious problems.